We started hearing murmurs of the DROID Bionic popping up over at the MotoDev site yesterday as its former self, but ran into a bunch of “Access Denied” pages while snooping. Thankfully, the folks at MDW were able to give us a gateway into the site, so that we could see for ourselves and then share with all of you. Before we start talking about what we are seeing, we’ll quickly shoot down the comments that are surely going to arise regarding the model number. Yes, we realize that the model number that is showing up says XT865 which is the old Bionic. Once you see the specs though, you’ll quickly realize that the model number is wrong and that you should ignore it. Update: Since we’ve seen enough emails about it, we thought we’d address it even further. Yes, we realize that the old model number of XT865 is listed. We totally get that. What you have to realize though, is the specs that are listed, are for the NEW Bionic. The old version was a Tegra 2 with just 512MB of RAM. The new build of XT875 is an OMAP with 1GB of RAM. The Moto folks just haven’t flipped the switch on the new model number yet, but have on the specs. Update 2: It looks like Moto pulled the specs, which is not surprising. And now you know why our “click here” link is an image taken from the site that will be available forever. No real big surprises, assuming these stand at release. Still a beast though. 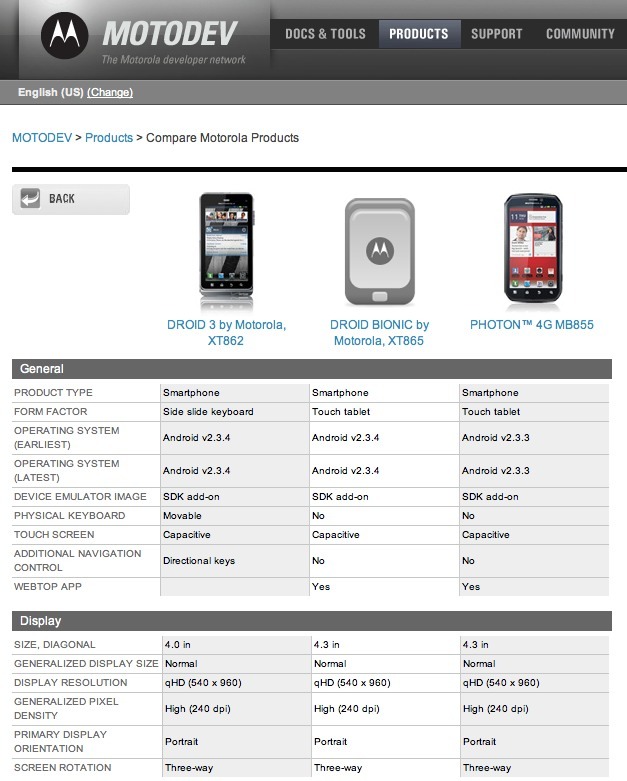 To see the full list of specs and how it stands up to the DROID3 and Photon 4G, click here. More at the MotoDev site.